The Glanzmann’s Thrombasthenia disorder affects the normal platelet function. The platelets form the body’s first response to cuts and other injuries which causes bleeding. When they function normally, the platelets stick together in a clump to plug an injury and stop bleeding. However, in people suffering from Glanzmann’s Thrombasthenia, the platelets are unable to clot the blood properly after an injury. As such, this condition can pose a serious issue in case of major injuries or surgeries because it can lead to blood loss in large quantities. Glanzmann’s Thrombasthenia is a congenital hemorrhagic condition, which means that the bleeding disorder -- resulting from defective platelet adhesion and aggregation -- is inherited and is present in the sufferers at birth. The reason behind the occurrence of Glanzmann’s Thrombasthenia disorder is that the sufferers have a quantitative or qualitative deficiency of a certain protein -- glycoprotein IIb/IIIa (GPIIb/IIIa) -- which is a fibrinogen receptor generally found on the surface of blood platelets. Due to the deficiency of the mentioned protein (the genes of which are carried on chromosome 17 of a person’s DNA), the bleeding time after an injury gets prolonged significantly because the platelets cannot bind properly with one another. Petechiae and ecchymoses (bleeding which occurs in the skin). Activated partial thromboplastin time: another test to check the blood-clotting time. There is no specific treatment yet for curing the Glanzmann's Thrombasthenia disorder. To patients who suffer from frequent episodes of severe bleeding, doctors may either replace the damaged platelets with normal platelets or suggest blood transfusion or injections of donor blood. The use of some excellent herbal formulations offered by Planet Ayurveda herbal manufacturing company can also prove to be very beneficial for the patients of Glanzmann's Thrombasthenia disorder. 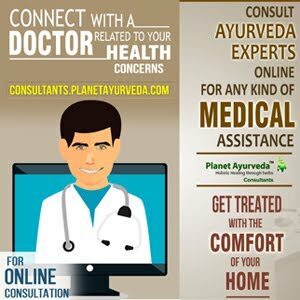 Specifically, five herbal products prepared by Ayurvedic experts at Planet Ayurveda can effectively manage the symptoms of this disorder. Pitta Balance capsules are an excellent combination of a number of potent herbs which can together be very helpful in managing Glanzmann's Thrombasthenia. These capsules have amazing detoxification capabilities and can strengthen the immune system of the body. 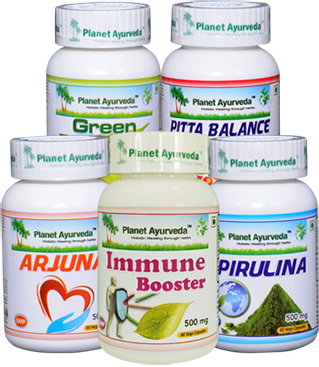 The main components of these capsules are Giloy satv (extract of Tinospora cordifolia herb), Praval pishti (coral calcium), Mukta pishti (pearl calcium), Jahar mohra pishti (calcium compound), Kamdudha ras (calcium compound), and Akik pishti (Agate calcium). Patients of Glanzmann's Thrombasthenia should take 1-2 Pitta Balance capsule with plain water twice a day, after meals. These capsules are prepared from the bark extract of the ‘Arjuna’ herb (Terminalia arjuna) which has proven capabilities to maintain healthy blood cells and support healthy circulation of blood. Moreover, Arjuna herb also keeps the heart healthy and maintains healthy metabolism. Furthermore, Arjuna herb is also widely known for its ability to maintain the balance of the body three physical energies or doshas (Vata, Pitta and Kapha), and three physic energies (Satva, Rajas and Tamas). The recommended dosage of Arjuna capsules for Glanzmann's Thrombasthenia patients is: 1-2 capsules two times a day, with plain water, after meals. Immune Booster capsules are a wonderful immunity-booster herbal formulation, prepared from several beneficial herbs which are capable of eliminating toxins and unwanted materials from the body, improving the metabolic rate of the body, and cleansing the body system completely. Moreover, the herbs used for this product -- which is an amazing dietary supplement -- are also very useful in fighting the formation of free radicals, and preventing the occurrence of infections. The herbs which comprise the key ingredients of Immune Booster capsules are: Grape seeds (Vitis vinifera), Amalaki (Emblica officinalis), Bhumi amla (Phyllanthus niruri), and Cow colostrum (Bovine colostrums). For Glanzmann's Thrombasthenia patients, the recommended dose of Immunity Booster capsules is: 1-2 capsules, once or twice a day. The components of these capsules are a number of powerful herbs which have proven properties for helping the formation of blood and repairing body tissues. The herbal components of Green Essential capsules can together make the immune system stronger, remove toxins from the blood, fight free radicals, protect against infections, and boost the energy levels of the body. The herbs from which these capsules are prepared include: Green Tea (Camellia sinensis), Grape Seed (Vitis vinifera), Alfalfa (Medicago sativa), Wheat Grass (Triticulum aestivum), Amla (Emblica Officinalis), Spirulina (Spirulina platensis), and Chlorella (Chlorella vulgaris). Patients of Glanzmann's Thrombasthenia should take 1-2 Green Essential capsules with plain water, two times a day, after meals. For preparing these capsules, pure and natural extract of the 'Spirulina' herb (Spirulina platensis) are used. The main benefit of this herb is that it strengthens the immune system, improves the body's energy levels, and reduces wear and tear in the body. Moreover, Spirulina herb has proven anti-oxidant properties and is abundant in micronutrients, iron and natural Vitamin B 12. This herb can also significantly improve the blood's haemoglobin, maintain healthy cardiovascular functions, treat allergies, and boost stamina. Glanzmann's Thrombasthenia patients should take 1-2 Spirulina capsules two times a day with plain or lukewarm water, 30 minutes to one hour after meals. Planet Ayurveda's herbal formulations can effectively manage Glanzmann's Thrombasthenia. However, since the patients suffering from this disorder have variable bleeding tendency which ranges from minimal bruising to potentially fatal haemorrhages, patients should immediately consult a doctor in case of severe bleeding after an injury.